Porch to front: 2 Oaklands Brighouse. Replacement of existing white painted timber frame single glazed windows to powder coated aluminium double glazed windows (RAL 9002), refurbishment of existing dormer windows and installation of new dormer windows and roof lights. Reinstatement of rear doorway and installation of new external staircase: 20 - 22 Commercial Street, Halifax. Use of land as garden area (Lawful Development Certificate): High House Barn, High House Lane, Midgley, Sowerby Bridge. Replace 3 standard NCR 5886 with new NCR 6627 ATMs to the George Street and Rawson Street elevations through the existing Ashlar sandstone façade. The existing apertures through the wall will be increased in size to accommodate the new ATM’s, so some existing stonework will need to be removed (Listed Building Consent): Lloyds Tsb Bank Plc, Commercial Street, Halifax. Prune Trees (Tree Preservation Order): Lynroyd, 300 Stainland Road, Elland. Demolition of outbuilding to facilitate construction of single storey side extension: 33 Caldercroft, Elland. Works to facilitate installation of ground source heat pump (Listed Building Consent): 3 Lower Shaw Booth, Shaw Booth Lane, Wainstalls. Works to facilitate installation of ground source heat pump: 4 Lower Shaw Booth, Shaw Booth Lane, Wainstalls. Conversion of attached store building to habitable rooms and construction of front porch: 40 High Street, Brighouse. Formation of menage: Hollins Clough, Broad Carr, Holywell Green. Non Material amendment to 12/00547, Change the use from gallery to wine bar: The Piece Hall, Piece Hall, Halifax. 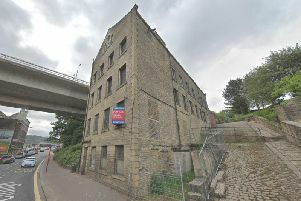 Submission of information to Discharge Conditions on application 17/00397/FUL - Condition 4: Riverside House, Ground Floor, North Dean Business Park, Stainland Road, Elland. Demolition of existing conservatory to facilitate single storey rear extension with access ramp: 4 Golf Crescent, Halifax. Removal of Condition no 3 on planning application 13/01369/FUL (retention of existing containers used as changing facilities): Land Adjacent To Cricket Ground, Blackwall Lane, Sowerby Bridge, Calderdale. Use of land for domestic purposes including the provision of a hardstanding and a concrete base (Lawful development certificate): Land North Of 18 Yarborough Croft, Northowram. Single storey extension to side: 11 Stile Moor Rise, Todmorden.